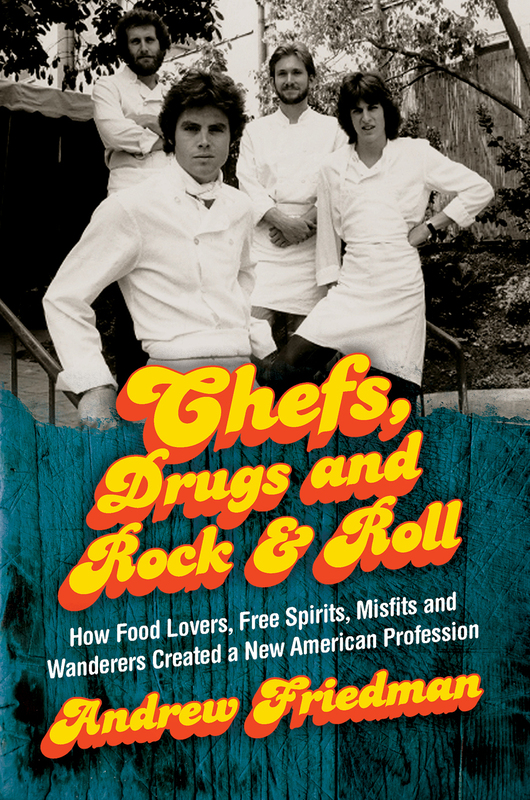 Hyde Park, NY – Chefs, Drugs and Rock & Roll: How Food Lovers, Free Spirits, Misfits and Wanderers Created a New American Profession is the new book by award-winning food author Andrew Friedman. The topic comes alive at The Culinary Institute of America in Hyde Park, NY on Wednesday, April 11, when Friedman and some of the personalities he writes about share their stories about how American chefs came into their own in the 1970s and ’80s. Following a panel discussion in the CIA’s Marriott Pavilion at 4 p.m., Friedman will hold a book signing. Both events are free and open to the public. Moderated by chef and media personality Michael Colameco, Friedman will be joined by CIA President Dr. Tim Ryan, Dean of Culinary Arts Brendan Walsh, and Senior Director of Food and Beverage Operations Waldy Malouf. Walsh was executive chef of Arizona 206 and Malouf was executive chef of the Rainbow Room when those restaurants were making headlines in New York City. The panel will also include Diane Forley, former chef-owner of Verbena and cook at many landmark New York restaurants, and Drew Nieporent, owner of Myriad Restaurant Group. Prompted by anecdotes from the book, panelists will share their recollections of the era. Topics range from the clash of cultures between established French chefs and the American game-changers, to how the politically charged backdrop of Berkeley helped spark this new profession, to Wolfgang Puck and an underrated group of Los Angeles chefs. The panel will also provide a look behind the scenes of storied restaurants like the Quilted Giraffe and River Café and give insight as to how and why American chefdom evolved into the thriving profession it is today. In addition to being the co-author of 21 cookbooks, Friedman has written seven books about the food world, including Knives at Dawn: America’s Quest for Culinary Glory at the Bocuse d’Or, the World’s Most Prestigious Cooking Competition; Don’t Try This at Home: Culinary Catastrophes from the World’s Greatest Chefs; White House Chef: Eleven Years, Two Presidents, One Kitchen (with Walter Scheib); and Dirty Dishes: A Restaurateur’s Story of Passion, Pain, and Pasta (with Pino Luongo). Knives at Dawn made Amazon’s “Best of the Month” list, and two of Friedman’s cookbooks won awards from the International Association of Culinary Professionals. Register for the book signing and panel discussions now.